Earlier this week, ESPN received word that Major League Baseball is planning to issues bans to over 20 players connected to Tony Bosch‘s steroid drive-thru, Biogenesis. If reports are true, suspensions of varying degrees will be issued, with Ryan Braun and Alex Rodriguez being banned for the rest of the season and then some. One hundred games to be exact. 100 game suspensions are usually reserved for “second offense” punishments and if any player receives a ban of this length as a result of the Biogenesis scandal, it will mark the first time that MLB has issued a steroid related suspension without the evidence of a positive test. Not only are these suspensions justified, but any and all suspensions issued by MLB as a result of this case indicate a new proactive approach to ridding the game of performance enhancing drugs – a step that is emphatically taken with 100 game suspensions. Bosch has been cooperative with the MLB Biogenesis investigation. MLB always seemed to be 90 feet behind the steroid issue. Although home run numbers were growing just as fast as the muscles and foreheads of the players in the nineties, Baseball didn’t implement a random drug policy until 2004, where a positive test would result in a 10 game suspension. The policy was updated in 2005 to its current ramifications, but only after Congress pressured the sport to do so. Even then, the PED policy appeared to do little to curb the use of steroids and other performance enhancing drugs in the game and seven suspensions were issued in 2012 alone. 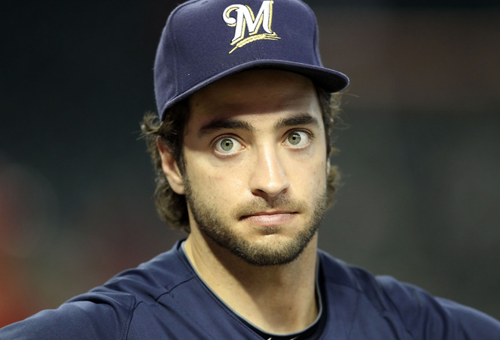 The biggest black eye to the policy came in 2011 when MVP Ryan Braun found himself in his first PED scandal. At the end of that season, Braun was tested. His results showed an increased level of testosterone caused by performance enhancing drugs. But since his urine sample was not shipped via FedEx on the same day they were collected, Braun was able to escape without a suspension, dampening the legitimacy and strength of the MLB PED suspension policy. A 100 game suspension issued to any player in the coming weeks would show exactly how serious MLB is taking the PED issue. This type of suspension would be the result of two factors, the linkage to the Biogenesis case and previous denials of usage to MLB officials. These two factors will more often than not go hand in hand, making 100 game suspension the norm and further disincentivizing the use and denial of PED’s. With this approach, MLB is able to sidestep the players union, which has been hesitant to incorporate any increase in severity of the PED policy. This might present an interesting legal battle for the league if they do issue penalties, but it is a fight worth having. The suspension, with an emphasis on its length, establishes the League as a legitimate advocate against steroids and validates the MLB’s desire to use every piece of evidence possible to persecute offenders. Unfortunately, giving Braun and A-Rod a 100 game suspension will not eradicate PED’s from the game, but it will show that MLB is taking cheating seriously, a stance that it hasn’t been willing to admit up to this point. Major League Baseball deciding to go forward and suspend these 20 players is good for the sport. It is high time the league took a stand. When it comes to A-Rod and Ryan Braun, any suspension will be a good suspension. The league is considering making an example of the two former-MVPs since both lied about their PED use in the past and are now implicated again. However, by seeking the maximum 100-game suspension (50 games for cheating and 50 games for lying about it), Major League Baseball is making a mistake. Lots of money buys good lawyers, and the players association will probably bring a lot of its clout to the fight as well. In the same way that Al Capone finally went to jail for tax evasion, so too should the League be happy to suspend Braun for just the 50 games. Braun got off on a technicality last time, and the League cannot afford to let that happen again. The length of suspension is not important. What is important is putting these players on record as having cheated. It will tarnish their image with the fans, vacate their records in the eyes of Cooperstown, and be a deterrent to future would-be cheaters that the MLB is finally taking this issue seriously. 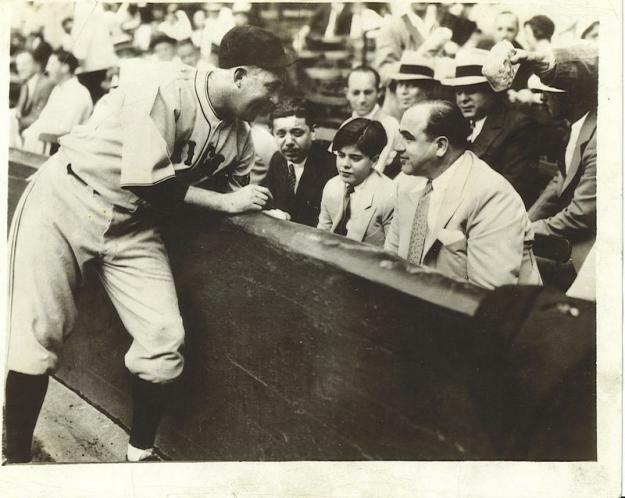 Capone was a baseball lover, but still ended up doing hard time. For this to actually work though, what is needed is a full-scale demonization of PED use in the game. It is time for everyone to stop looking the other way. The league needs to do everything in its power to show that it is taking cheating seriously. This means that these 20 or so players identified in the Biogenesis documents need to all be suspended and on record as cheaters. There are calls everywhere to make the penalties longer, from 50 games to 100 games for first time offenders, for instance. This increase in length of suspensions would be hard to do because of the agreements that the players association has with the league. The length of the suspensions is not as important as the suspension itself. Penalties themselves do not dissuade players from trying to get a leg up. Players by their nature will do everything they can to try and get a little better. The important thing will be in convincing players not to cheat. This will only come if the media, owners, and organizations agree to stop looking the other way when it comes to known cheaters. Melky Cabrera, one of the players implicated in the Biogenesis documents, was suspended last year in the midst of his best year in the big leagues. The Giants moved on and refused to put him on the postseason roster even though he was eligible. In his contract year, he didn’t receive the extension he was seeking, but did receive a lucrative 2 year, $12 million deal from the Blue Jays in the offseason. Bartolo Colon was suspended last year for PED use, but the A’s decided to resign him anyways and he currently sits as both the ace of their staff and an All-Star. There are around 18 other players listed on the Biogenesis documents. This means that around half the organizations in baseball have decided to look the other way at their players PED use. There are hundreds of young players that are toiling away in the Minor Leagues and doing everything right trying to make it to the show. The League needs to stop rewarding cheaters and keeping them around as it sends the wrong message. Minor Leaguers and even some college and high school players feel that they have to use PEDs to make it as well. PED use becomes both a feedback loop and self-fulfilling prophecy when gone unpunished or brushed aside. The League can get this right. The first step is going through with these suspensions and getting these players on the books. The second step will be up to everyone to decide if we can finally move forward as a sport. Do the Pirates Have What it Takes? The Pittsburgh Pirates are once again off to a hot start. The owners of a 53-34 record, good for second in their division, the Pirates are looking to finish 2013 in the style they hoped to finish 2012. If current trends are any indicator, Pittsburgh should have no problems locking up their first playoff birth since 1992. The biggest strength that the Pirates have this year is pitching, although it wouldn’t seem that way when looking at the starting rotation. 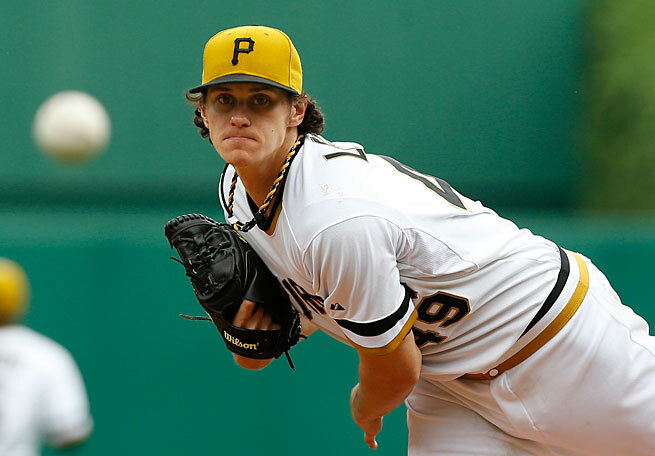 Entering the season, Pittsburgh’s starting rotation consisted of A.J. Burnett, Wandy Rodriguez, Francisco Liriano, Jeff Locke, and James McDonald. The first three names of that list are the most recognizable but also came with the most uncertainty at the beginning of the season. Burnett entered the season at 36 years old. Wandy Rodriguez is 34. And Francisco Liriano has always been known to have streaks of greatness that are perpetually stalked by an inability to throw strikes. McDonald was going to be a solid mid rotation guy, and Locke, with half a years experience, would attempt to fill out the back end. Once the season got underway, all expectations were exceeded and the rotation proved to be a dominating force. Burnett showed that the Fountain of Youth filters out of the Allegheny River, pitching to a 3.12 ERA and 10 K/9 in 14 games. Wandy drank some of the same stuff and produced equally strong numbers. But the real stories went to both Francisco Liriano and Jeff Locke. Liriano was a high risk/high reward acquisition that many assumed would do far more damage to the team that dared take a flyer on him. But so far, he has been magnificent. Through 10 starts, Liriano has posted a 2.23 ERA and a 9.9 K/9. While the walk rate remains high on the higher end of the spectrum (3.41 BB/9), he is still well under he previous two seasons, which both had a BB/9 ration of 5. While it’s hard to apply the decreased walk rate to any one thing in particular, Liriano will continue to be an asset to the Pirates if that walk rate stays down. Locke, who has been equally as dominant this year, has a different set of concerns. While on the surface his 2.06 ERA and 7-1 record look remarkable, some of his other numbers raise some questions. So far this season, Locke has been very fortunate to strand a large amount of runners on base. He currently stands with a 85.6% strand rate, which is unsustainable for any big leaguer. Locke has also given up fewer home runs than his fly ball rate would support (8.2%), another reason for second half regression considering it is far under his career average. As both of these stats return to the norm, Locke will see his ERA climb closer to his xFIP of 4.11. Even with this regression though, Locke should continue to contribute to the Pirate rotation in a meaningful way. There is no denying the strength of this rotation. The pitching staff that is 1st out of all major leagues when it comes to team ERA (3.11) and opponent batting average (.225), and third in baseball in WHIP (1.19). But strong rotations tend to get teams only so far before injuries and bullpens cost the team wins. The Pirates have already been faced with these challenges this year and have proved that they have depth, both in the minors and in the pen, which make up for the doubts within their rotation. So far this season, the Pirates have had to fill their rotation after injuries left them with holes. First they turned to Jeanmar Gomez who after starting eight games, currently sits with a 2-0 record and a 2.76 ERA. They also were forced to turn to highly touted prospect Gerrit Cole, who started his career off 4-0. The bullpen has also been one of the safest late inning bets in the MLB. Jason Grilli leads the NL in saves and is 27-28 in save opportunities. 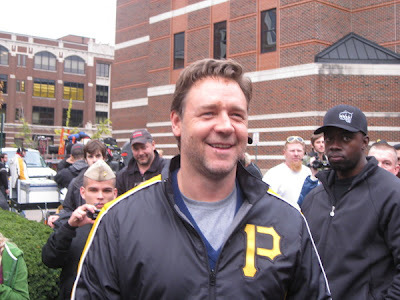 Before Grilli enters in the ninth, the Pirates have the best set-up men in the game. Mark Melancon has and ERA and WHIP just above 0.8 in 41 innings. The rest of the bullpen combines to have an ERA of 2.92 and an opponent batting average of .217. The strong bullpen helps to fill in for the starting rotation which averages just over 5 1/3 innings per start. The Pirates second half will not be as good as their first half. The starting rotation will continue to be tested and there will be some regression for Locke and the questions with Liriano will remain. 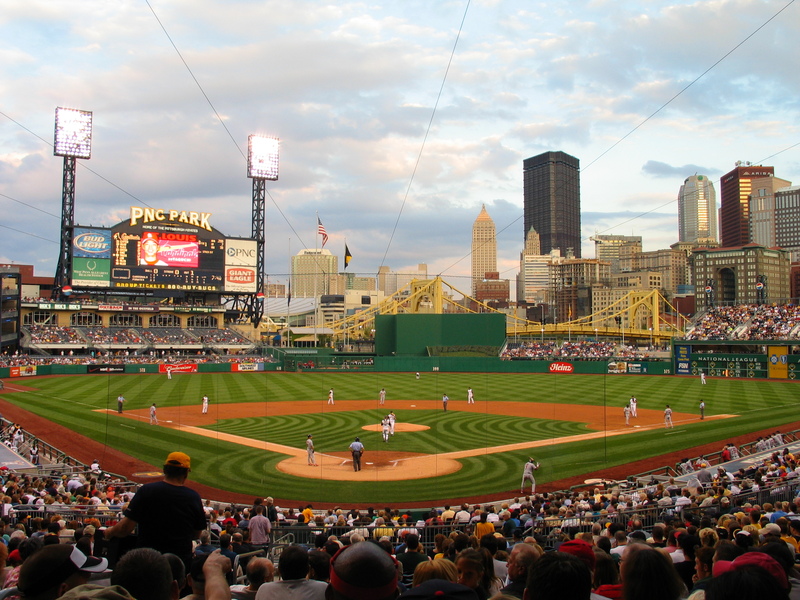 But the Pirates have proven that they have the depth to overcome any pitching problems that may arise. The Dodgers are currently in the midst of a hot streak. After splitting a series with the Padres, they went on to sweep the Giants and take two of three from the Phillies, leaving the team four games out of first place. There is a sense of optimism in Los Angeles; Nick Punto in an after game interview mentioned the p-word (playoffs), an unusual topic for teams who have been trapped in the cellar for the past month. A big part of this hopeful outlook is because of rookie phenom, Yasiel Puig. The 22 year old Cuban defector has maintained a .436 average in his first month in the big leagues. With 7 home runs and 4 stolen bases, Puig has produced a large chunk of the Dodger offense while removing much of the pressures from his injured and/or struggling teammates. 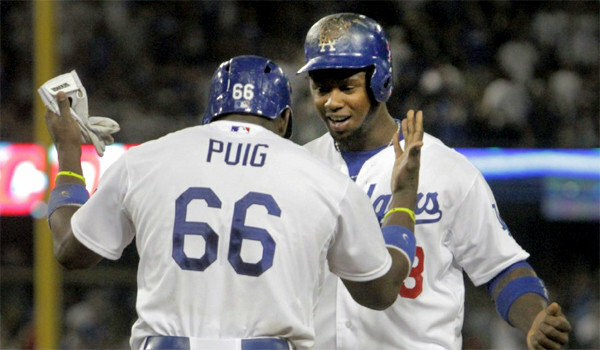 As Puig garners more headlines, the rest of the team’s struggles seem to fade from memory. Nobody is more pleased to have his name disappear from the papers than Don Mattingly, who appeared to already have his bags packed before the rookie was called up. 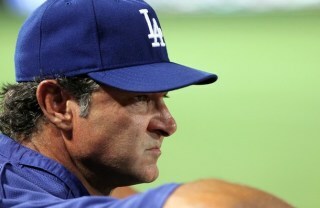 Mattingly has had a rough year, and while much of this is a result of the struggles of the heavy hitters on his team, he has done little to boost the confidence of LA fans or prove his competency at damage control. Mattingly has hear boos in Dodger Stadium this year get louder after he would take the field to pull Brandon League after another blown save. (It’s hard to say that the jeers are entirely Mattingly’s fault; if your GM decides to give a reliever seven million dollars a season, your hand is forced.) While Puig has helped damper the amount of Mattingly’s boo’s, the Dodger manager has not received enough credit for the work he has done with the lineup. There has been quite a lot of noise in the sabermetric community about reinventing the traditional batting lineup. Usually, a manager will put the fastest guy first, a good sacrifice guy second and then the big and best hitters three and four, with the primary goal to manufacture runs in the first inning. The rest of the lineup descends in order of skill. 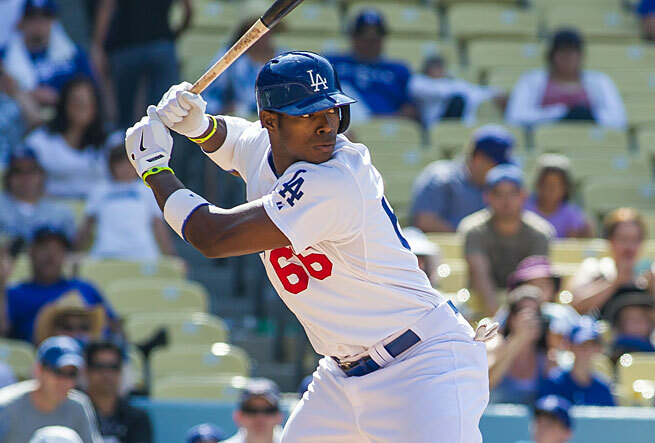 After shuffling Puig around in the lineup during the first weeks of the rookie’s call-up, Mattingly has settled him into the number two hole and been rewarded with great success. Most notably was game 1 of the recent Giants series. Puig homered in the first inning off of Bumgarner, which the giants countered in the second inning and the game remained tied until the eighth. Puig stepped into the batters box with two on and no out and singled to score the go-ahead run. The Dodgers went on to score again that inning, but they wouldn’t need it as the team won 3-1. Three nights later the Dodgers were losing to the Phillies by one in the seventh inning. The bases were loaded with two outs and Puig steps up to the plate. Sure enough, the rookie hits a single scoring two and handing the Dodgers the lead they would need to win the game. Only a month into his career, it is fair to question whether Puig is the best hitting Dodger. He is adequately described as “raw”, which is continually evident as he chases breaking balls low and away and currently sits with a 5:1 K to BB ratio. But there is no denying the fact that he has been the best hitting Dodger in June. The lineup has also been built around Puig, with Gonzalez, Ramirez and Kemp hitting directly behind him in that order. As a result, Puig has scored six times during the last nine games, which has been vital since the team won by 2 or less runs in six of those games. While there is no guarantee that Puig will find himself in (and producing in) these clutch situations as often as he has been, Mattingly should receive more credit for trusting the odds of the batting order and batting his best hitting Dodger second.